“A section from Rolls: 1971, which I feel stands well on its own. 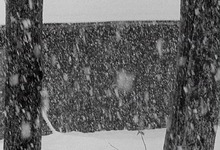 The continuous field of falling snow appears to break into three planes or zones of different density and speed. I think of Snow in some sense as nature’s answer to Spray.”—Robert Huot.